You’ve seen one – more than once likely. They typically come in a big white square. Sometimes in black and newer versions can be all metal and a bit more circular. They can sit on a floor, in a window, or be mounted to a wall. Have you guessed what I’m talking about yet? If you guessed Box Fan then you’re on the right track. There are many options when it comes to box fans and differentiating between them can be a tough task because they are all so similar – especially if you’re committed to the standard square. If you are willing to broaden your horizons a little bit and consider the circular options as well, then your list becomes a lot longer, for better or for worse. We’ve also included a few of those on our list as well just to give a full picture of what your options are when you are looking to ventilate a room, dry a room out, or make your hard earned money go a little farther when it comes to air conditioning. A good box fan can and will do all of those things and can really make a big difference in the everyday comfort of your home, office, or gym. 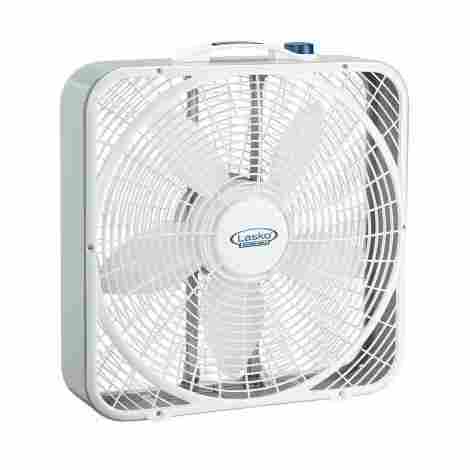 This is a great little box fan that is sure to keep you cool. It is aerodynamic and comes in both an 11 inch option and a 15 inch option. You are able to mount it on the wall or sit it on a table, whichever suits your needs best. The 7 inch blade will spin on three different intensity settings and rotates 90 degrees for maximum cooling. This fan blows and it can blow hard. It is very effective at cooling and can be used personally or can be used for energy saving air circulation. One of it’s best features is that it is much quieter than other similar models and you will hardly notice it’s presence. This fan can be mounted on the wall so that it will blow at whatever level you want, but it is also capable of sitting on any hard surface. That way you can put in on the floor, on a desk, or a table - wherever will give you the most air circulation and cooling that you need. Despite it’s great functionality, this unit comes to you at a very small price. Compared to others on this list, it is easily among the cheapest. You will get a lot of cool air for not a lot of money and be much happier for it on a daily basis. 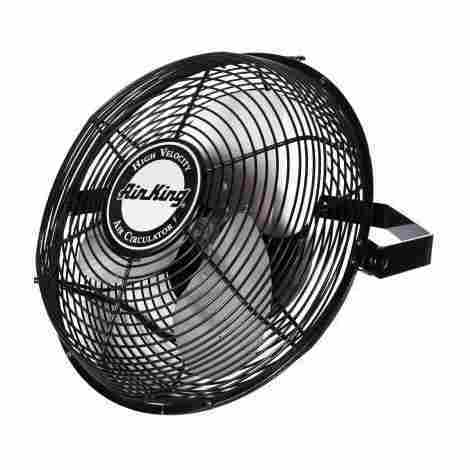 This type of fan is made in the USA, is a 20 inch fan, and come with a plastic body. It includes an easy lift handle so it can be carried to wherever you want it to go. It comes fully assembled and has three high performance speeds so you can customize your air to fit your situation. This unit is designed with a pivoting head. What that means for you is that you can tilt the head to basically any angle and blow air in that direction. You want to blow air on the floor? Pivot the head to do so. The same goes for blowing air towards the ceiling, wall, or bed. You can blow air wherever you need it to go. A very important safety feature on this fan is the blue plug feature. It will sense if there is a potentially hazardous electrical fault and immediately turn the unit off. The electric current is cut off and there is no further flow until it is safe again. This fan does cost a little more than the last one on our list, but it does also come with several advantages. The biggest, perhaps, being the added safety feature of the blue plug. It lasts a decently long time and is still very affordable. If you are looking to dry something or cut down on your electric bill, this is a good option. This is a newer style fan with some neat upgrades such as a remote control, programmable timer, and cord storage. It has an oversized handle for easy carrying and is plugged into a standard 120 volt outlet. It has both plastic and metal elements and three different speeds. A neat feature of this unit is that it has an adjustable timer. 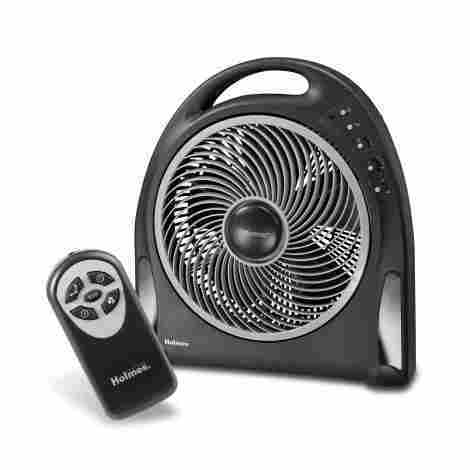 You are able to program your fan to automatically shut off for up to 8 hours. This can be an incredibly helpful tool, especially when you want to fall asleep with it on, but don’t want it on all night or other similar situation. This fan is designed to cool large areas and does, in fact, offer much relief despite it’s smaller size. It is designed with a larger blade diameter and a rotating grill which helps to increase airflow by 40%. That is also helped by the shrouded housing encasing the blades. It provides excellent cooling relief even in large living areas. This is a very middle of the line priced fan. It does have some cool features that make it worth more than the cheapest ones and provides great cooling relief. It will work hard and long and well outlive its initial cost. You know that a fan called a Hurricane is going to have some pretty strong winds blowing out of it. This entire series is actually given “categories” similar to how real Hurricanes are classified. The classic series is a Category 2, and is typically sufficient for everyday needs but do be aware that if you need something stronger, Hurricane has you covered there too. 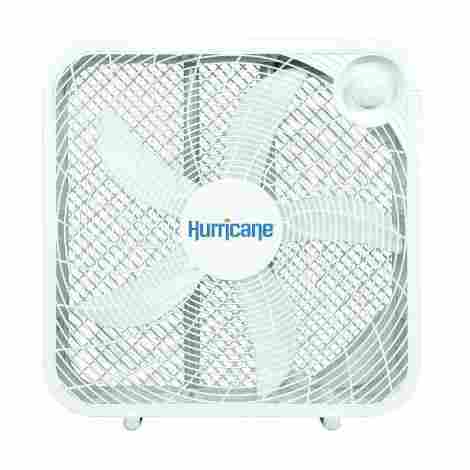 Whether you need a box fan in your house, office, gym, apartment, garage, greenhouse, or workshop this Hurricane has you covered. Even if you need a box fan due to a recent Hurricane, fits the bill. It really gets the air moving and will help dry things out, keep things cool, or make sure that it doesn’t get smelly or stale. This unit has great potential to save you money. Not only is it cost effective itself, but it has such reliable and consistent performance that you really can use it to help cool off your house. If done correctly, it can reduce the use of your AC and, in turn, your electric bill. Near the bottom of our list in cost, this fan falls near the top of our list in quality and positive reviews. 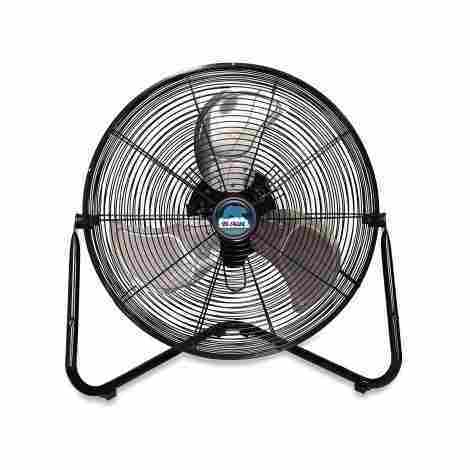 Nearly everyone loves their Hurricane fan and is highly likely to buy another one, They are inexpensive and can make a big difference in how cool your space is to how much you are spending overall. Ultimately, this is a purchase you will be satisfied with and may even come back for another one. If you don’t want to waste your time trying to find the most budget friendly fan that will last you a decent amount of time and want to just jump right to something that will blow a lot of air and last you for years to come, then you may want to consider an Air King. It is powerful enough to work in even big spaces and will provide mega circulation. This unit features several pieces that make it more durable than your typical box fan. It comes equipped with powder coated steel guards, mounts, and blades. The ⅙ horsepower engine is permanently lubricated ball bearings, has a split capacitor and is fully enclosed. Another neat feature of this fan is that is pivots. This will ultimately allow you to get air to every corner that you need it in and really provide good air circulation. Because it is powerful enough, adding in this feature really makes it perfect for any industrial setting like in a school, hospital, or manufacturing plant. Quality and long lasting durability don’t come cheap and that is indeed the case hear. You will end up paying about triple the price of a budget fan when you get this one, but that price will likely not be an issue as this one won’t need to be replaced anytime soon, and often serves a different purpose than a cheaper one would. 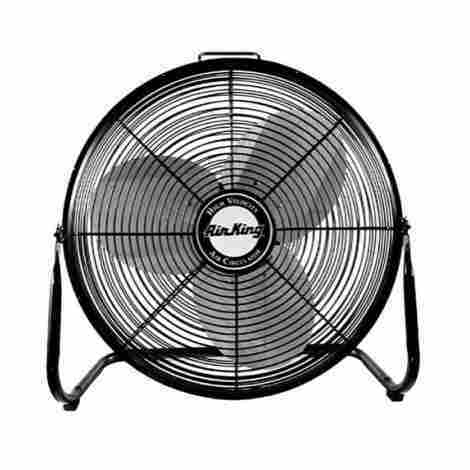 It is a strong and powerful fan that you will be happy you got if you are looking to circulate a lot of air. 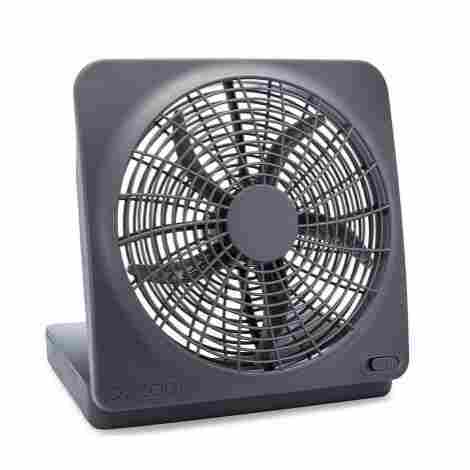 These fans come in all shapes and sizes and sometimes you need one that is small enough to put on your desk at work, or one that is battery powered so that you can take it with you on the go. This is that fan. It is smaller, very easily portable, can be battery or plug operated, and will cool small spaces very effectively. This is the perfect size for portability. You can take this wherever you want to - in the car, outside, at work, the sky's the limit! It folds up nice and compact so it is easy to transport. It is nice and slim so it will fit into small spaces even when opened up and turned on. The power to choose is a great thing. The power source that you use is up to you when you purchase this unit! It can run on 6 D-cell batteries, or if you prefer, you can plug it into the wall with the included AC adapter. That ups its portability, and its appeal as you are not locked into one location or even power source should the power go out and electricity isn’t an option. Despite it’s smaller size, this fan runs right about the same cost as other, larger bargain fans mentioned above. While it may not blow as much air as they do, it is still worth the cost because it has other features that are somewhat unique to this style. If you want a fan that you can take with you wherever you go, that is small, but still effective, you will be happy with this purchase. 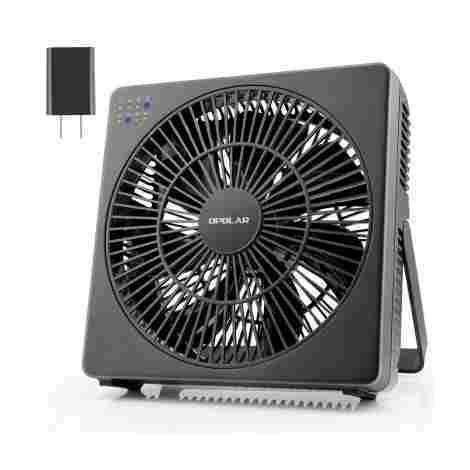 This is an easy to use, standalone box fan. It is a 20 inch fan and bears the blue label and plug which mean that it will shut off when it senses an unsafe electrical current. It is easy to run and operate and costs less than two cents an hour to run, making it very energy efficient. While it is not water or weatherproof, this is the most weather resistant fan that Lasko makes and it is deemed safe and functional enough to be used in an open window. This is great for moving air into or out of a room. Into the room to help bring in fresh air and out of the room if the air is hot and you are trying to ventilate. This unit is designed for stability. It is just a little bit wider than other fans at 4 ¾ of an inch. However; it is still very lightweight and easy to carry like a box fan should be. The controls are found on top, as well as a carrying handle so that it is easy to move to wherever you’d like it to be. This fan can be yours with not much out of your pocket at all. This is one of the cheapest options on our list, and in general. It works hard for a long time and will even save you money when used in conjunction or as a substitute for your air conditioner depending on your climate. Overall, this fan will ultimately pay for itself in the long run and leave you very pleased with your purchase. 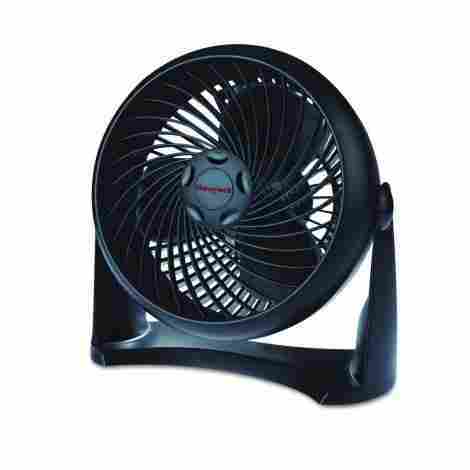 This fan is one that is intended to be used in a garage, kitchen, or anywhere that needs a good amount of air flow. And air flow it provides! It’ll blow all other standard box fans out of the water with how powerful it is. It is adjustable, has three settings, and comes with a one year warranty. This unit is built entirely of metal. The blades and housing on both the front and the back are made of a durable, long lasting metal. This also makes it very easy to clean as well as take apart and put back together should the need arise. It is very easy to adjust to fit your lifestyle. Do you need to wall mount your fan so that it’ll blow air at a higher level than the floor? You can find that in this fan. Do you want the ability to tilt your fan at precise angles depending on your exact need? This one can do that. It is easily adjusted and/or mounted so that it will easily serve many purposes. This is one of the higher end fans on our list, but it’s price doesn’t necessarily reflect that too much. It is more expensive than the bulk of fans included, but not very much so. If you are looking for a fan that will move a lot of air, but isn’t one you intend on using in the bedroom while you sleep then this is your fan. You’ll be happy you splurged those few extra dollars. This industrial grade model will make all of your air circulation dreams come true. It blow a ton of air and is capable of cooling most spaces. It is all powder coated metal, made in the USA and OSHA certified. It has three speed settings and is a perfect option for the warehouse, gym, loading dock, or other commercial space. This unit was made to be mounted - and it is reasonably easy to do so. Mounting comes with several advantages over fans that are floor units. It gets the cords off the floor and eliminates the potential for tripping. It is also great for saving space. When you hang something in off of the wall, ceiling, or beam, you aren’t using any of your potentially limited floor space. Industrial grade generally means that things work harder for longer. That is absolutely the case here. The motor is built to be virtually maintenance free and meant to last many years. It is also built to provide a high amount of air circulation. It lives up to all promises. You don’t always like the price of items that are really high quality and will last a long time. That is probably the case here. This is right at the top of our list as far as price goes. However; it’s design and the materials used will have it lasting much longer than others that come at a smaller price. It is also one of the few that is made in the United States, which also means a higher cost - but typically also means a better product. This is another great small fan option. It has seven blades that have an 8 inch diameter. It is energy saving, has 4 different speeds and a natural wind flow, and also includes a timer function so you can set it, go to be, and forget about it. Unique on this list to this unit is the way that it is powered. It actually supports two different options, both of which come included. It can be plugged into the wall like a traditional fan, but it also has the option to use a USB cord. This gives it great portability as you can find a USB port virtually anywhere. This is also great for emergency preparedness as a fan could be an essential item as well as the option to use it when the power is out for an unknown amount of time. The nice small design is sleek and meant to work on a desktop. It is square and each side measures 8.2 inches on each side. It has a convenient handle so that it can easily be carried or moved. 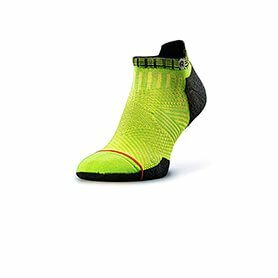 In addition, it is built with an anti-skip design with a rubber bottom to ensure stability and minimal vibration. This rings in cost wise just about the middle of the pack. It is considerably smaller than most others on this list, but that may not be a bad thing depending on your needs. Overall, it isn’t too expensive and may be exactly what you’re looking for. It functions well and is perfect for small spaces. Box fans can really be a great addition to your home. They can help to cool a room or simply circulate the air of a room that tends to get stale. They can create a perfect white noise to help you sleep and even better, they can help you save on your electric bill when they are strategically used in conjunction with an air conditioner. They are also great for drying things out after a natural disaster or for providing some sort of cooling mechanism during the aftermath of said disaster if there is no electricity (and you have the right unit to use without a plug). 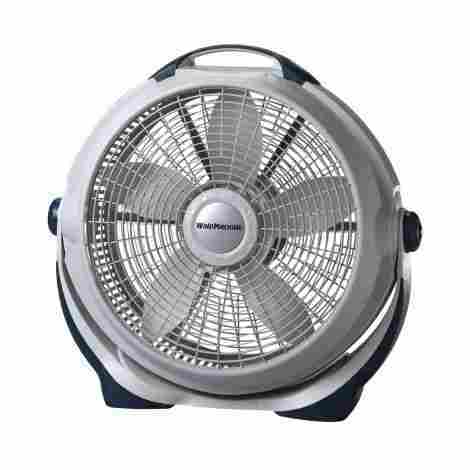 There are a lot of reasons to have a box fan and you want to make sure that you have the right one for your situation. The option that is best for you will vary based on a number of factors. You will need to consider things like where you are going to put it, how loud you can tolerate, how much you need it to blow and what you want it to be made out of. When you weigh all of these things together, you are sure to get the perfect fan for your space. The first thing you need to determine is how big you want your fan to be. There are several things to consider to help you get the right size. Where are you going to put your fan? If you are looking for a fan to put on a desk, then you’ll want a small one that will actually fit on your desk. You also probably don’t want it to blow too hard as it will be sitting right next to you. If you plan on putting it on the floor of a bedroom or bigger living room, then a bigger fan is a better option. A 20-inch fan is a pretty standard size and is capable of moving a decent amount of air – enough to cool a room. This is also the size you would likely want if you are looking to put it in your window for even more airflow. You won’t want something too big, but you also want something big enough to make a noticeable difference. Finally, if you are looking to put a fan in an industrial area like a gym, warehouse, or even a garage then you will want to get a bigger and more powerful fan. We’re talking big, metal, mountable fan that makes a lot of noise. This will absolutely be your best bet here because they move a lot more air and are more capable of cooling bigger, potentially hotter, and stinkier areas than any smaller fan will ever be. Noise level is absolutely a big deal when considering the purchase of your fan. They all make noise and each person is going to tolerate noise just a little bit differently which makes it hard to determine off reviews alone just how much noise it will make. That being said, the noise a fan makes can be a good thing if you appreciate white noise. There are even noise machines with box fan settings. Generally speaking, the smaller the fan the less noise it makes. Also, generally speaking, the more plastic a fan is the quieter it is. It should be noted that the best, quietest plastic fans are ones that are sturdy and well balanced as well as put together well. This will ensure that they don’t whine or squeak or fall over – all of which are annoying and far worse than the noise of a fan itself. Ultimately, you need to weigh your noise tolerance with your need for air movement. You can get a great fan that isn’t too loud, or you can get a great fan that makes a lot more noise. Your choice will depend largely on your specific needs. Almost every fan you find will have at least 3 settings. That is true for all listed here, with some having more options than that. How fast or slow each of those settings will go varies based on the fan. The bigger the unit, the faster it will blow and the more air it will circulate. A smaller desk fan can’t be expected to function well in cooling an entire room and the same goes for the reverse – a big industrial fan just doesn’t make sense in the bedroom while you are trying to sleep. You will need a bigger fan if you are trying to cool entire rooms, particularly big rooms. You’ll need an even bigger one if you are trying to cool entire warehouses, gyms, schools, or hospitals. There are pretty much two materials that your fan can be made out of – metal or plastic. The verdict is really split here. Plastic can be great and move a lot of air, but plastic also tends to give out faster. Noise level will vary with both, but generally speaking, metal is louder. Plastic can also be noisy, though the noise with plastic tends to be more of an annoying whine. A bit thing to consider when trying to decide on material is that the biggest determining factor in price is whether you get a plastic or metal fan. Metal is far and away more expensive than plastic. You will pay at least double for a metal fan. Even the most tripped out plastic fan will never cost nearly as much as the most basic metal fan. A lot of speaks to how much longer a metal fan will last. You will go through at least a couple fans in the lifespan of one metal one. Q: Does this fan rotate? A: While all fan blades rotate, not all fans themselves do. In fact, most box fans do not. There is only one on this list that rotates on its own accord. That being said, most can be positioned at various angles so that you can direct the air to where you want it to go. Q: Is this fan noisy? A: Inevitably, all fans will make noise. Most of the time it is welcomed white noise. Though, the bigger the fan and the more air it blows, the more noise it will make. The same is true for cheaper plastic versions. They tend to whine and make an irritating noise. Q: Can this fan be used outdoors? A: Most cannot be used outside. They are not weatherproof and can be ruined by the elements. Some will function in a covered area, though they are definitely of the more expensive variety. Q: Does this have a two or three prong plug? A: Most come with a two-prong plug, however; those of the industrial variety may have 3 prong plugs. There are even a couple that have alternative power sources (battery, USB). Q: What type of material is this fan made out of? A: There are two standard materials that are used – metal and plastic. Almost uniformly, the more expensive the fan the more metal that was used. It should also be noted that the more metal in the fan the longer it seems to last. Q: Can this fan be mounted on a wall? A: Some are even for that exact purpose, but not all can be wall mounted. The more traditional the box fan, the less likely it will be able to be wall mounted.